This programme will equip you with transferable knowledge and skills in economics and business studies combined with an application of these disciplines to the east European region. You will gain an enhanced understanding of the complexities of the region and have the opportunity to become proficient in an east European language. A total of 18 points in three higher level subjects including grade 6 in Mathematics, with no score below 5. A total of 17 points in three higher level subjects including grade 6 in Mathematics, with no score below 5. You will gain insight into the theoretical, conceptual and analytical tools of social science and their application in understanding the processes of transition and transformation in Central and Eastern Europe. This programme is taught by academics who are actively researching in the field, most of whom speak one or more of the languages of the region. 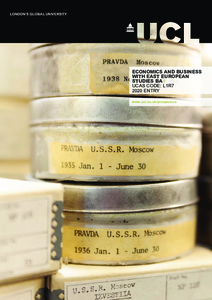 The UCL School of Slavonic & East European Studies (SSEES) is the largest national centre in the UK for the study of Central, Eastern and South-East Europe and Russia. The SSEES Library contains over 400,000 books, journals and film resources. The department is regularly consulted by organisations such as the Foreign & Commonwealth Office, the European Bank for Reconstruction and Development and the European Union. You will take compulsory modules in economics and business in years one and two, with a compulsory dissertation in your final year. In each year you choose the remainder of your modules from options in economics, politics, sociology, international relations, mathematical and statistical methodology and language. You will be strongly encouraged to learn a language of the region as part of your degree. Not only will you be able to make use of our excellent language teaching resources, but you will also be able to access the foreign language newspaper and television resources of the SSEES Library. You may also choose from other Russian, history or east European modules. You will select a further 1.5 credits from a range of optional modules. You may also select from other modules available within SSEES. You will be taught through a combination of lectures and classes. In classes you will be expected to prepare presentations on selected topics, sometimes as an individual and sometimes as part of a group. These will be followed by class discussion. You will be set regular written work, including essays and exercises involving qualitative methods. You will receive feedback from tutors on both your oral and written presentation skills to help develop your ability in these areas. Your assessment will be based on unseen written examinations, coursework and a dissertation. For the final-year dissertation you will have a supervisor to provide you with advice and guidance. After graduating from this programme you will have transferable knowledge and skills in economics and business. You will also have expertise in a region where complex issues of political change, economic development and international relations are reshaping national and social expectations. Career destinations of previous graduates include government service (in the UK and the EU), international agencies and non-governmental organisations (NGOs), consultancy (economic, political risk, security, marketing), banking, financial services, law, media, teaching and the leisure sector, as well as further study. We use your qualifications, predicted grades and personal statement to assess your suitability for this programme. Your personal statement should explain your motivation for applying for this programme, what it is that interests you about the study of Russia and Central and Eastern Europe, and provide evidence of an interest in economics and business. On the basis of our assessment of your application we will decide whether to make you an offer. If you receive an offer, we will invite you to an applicant open day (if you live in the UK). The applicant open day will include introductory talks providing more information about SSEES, our language options, our facilities and your chosen degree. You will also have the opportunity to ask questions, and take a tour of UCL led by current students. A level Mathematics or its equivalent is a requirement for this programme.